【Leakproof & Heat Preservation】This Lunch Bag made of 900D oxford fabric, water-resistant and tear-resistant for long lasting use. 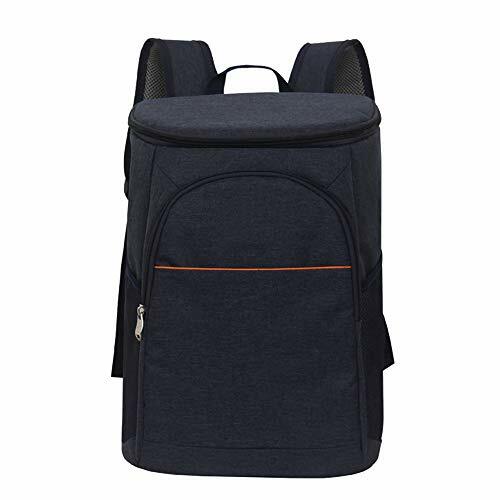 High quality 5mm pearl cotton in the middle layer strengthen the durability of the lunch bag. Inside aluminum foil ensures the continuous cold/heat preservation. Leakproof guarantee, your food will be safe inside. 【Wide Application】This lunch tote is suitable for all people like businessmen, teachers, students, women, men, children, adults and is also great for work, school, office, travel,camping, BBQ, holiday, vacation, park and picnic. 【Three Ways to carry】Comes with removable and fully adjustable shoulder straps. You can carry this lunch bench in 3 ways: single-shoulder, messenger bag, handheld bag. Size in: 22x22x16cm/ 8.7x8.7x6.3inch. Weight 45g only. 【100% Satisfaction Guarantee】We take pride in delivering top quality products and are proud to offer 90 day money back guarantee in case you are not 100% satisfied and wish to return the product for ANY reason. 【8L Capacity&Removable Aluminum Interlayer】8L capacity insulated lunch bag lunch cool bag lunch containers can hold about 10 cans coca and the space on the top holds also 2 cans drink. Comes with removable aluminum interlayer, divide the inside compartment into 4 parts, enable more neat and clear organization. Ensure you can DIY your own packing, with safe keep. The front two pockets are great for bottle and condiments, phone or etc. The back mesh pocket also extra space for knives, forks, etc. If you have any questions about this product by ele ELEOPTION, contact us by completing and submitting the form below. If you are looking for a specif part number, please include it with your message.